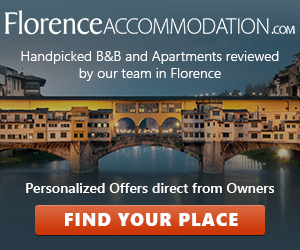 At Eastern time Florence is pretty crowded with italian and foreign tourists that are also very interested in monuments and museums. Here you can find the opening times of the most important museums and churches during the Easter week-end. 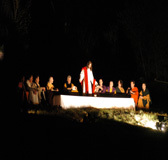 A beautiful hill with olive trees and young oaks, stone walls and paths climbing amidst the broom � this is the natural setting for the re-enactment of the Passion that takes place in Grassina on Good Friday evening. With a set like this, all that is required is a few extra theatrical touches to create a magically atmospheric harmony of colour, sound and light that leaves spectators entranced. The re-enactment starts at 8.30 pm on Good Friday evening. The main actors are then joined by the participants of a procession that, starting a little earlier, has wound its way through the streets of the village. They perform in and take walk-on parts in the key scenes of the Passion, helping to form a rich and visually imposing series of tableaux. The tableaux depicting the life of Jesus take place in the following order: Prologue; Annunciation; Visitation; Nativity, Baptism of Jesus; Sermon on the Mount; Dance of Salome and the Martyrdom of John the Baptist; Raising of Lazarus from the Dead; Betrayal of Judah; Last Supper; Passion and Arrest of Jesus; the Sanhedrin; Court of Pontius Pilate; Damnation of Judah; Crucifixion; Deposition. The first part of the procession consists of characters from the 'Roman world': centurions, Longinus, Pontius Pilate and his wife Claudia Procula, Roman soldiers. The second part is formed by figures from the 'Jewish world': Herod and his court, Caiphas and other priests; Barabbas; the thieves, and a large crowd of Jews. Finally, there are the characters of the Passion as mentioned in the Gospels. When: entrance at 9 pm (with ticket, on sale in Florence at Firenze Box Office), the re-enactment starts at 9.30 pm. 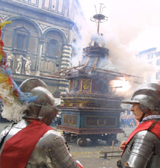 The ceremony that gave rise to the modern-day Scoppio del Carro (�explosion of the cart�) officially became public in 1102, at a time when the Pazzi family enjoyed great fame and prestige, partly as a result of Pazzino�s heroic deeds during the First Crusade (1096). However, the Pazzi family were stripped of all their wealth and privileges, and exiled from Florence, after their aborted attempt to overthrow the Medici in 1478. 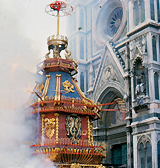 From that moment on, the Signoria took over responsibility for the preparation and celebration of the ritual explosion of the cart. The ritual has not altered over the years. The richly decorated cart, which dates to the 18th century, is hauled by gaily bedecked oxen from Porta al Prato to the cathedral square. A wire is run from the choir of the cathedral and fixed to the centre of the cart. In the meantime a procession of clergy leaves the Church of the Santissimi Apostoli and goes to the Baptistery for a religious function. At midday a dove-shaped rocket is released inside the cathedral; it slides along the wire, leaving a trail of smoke along the length of the nave. When it reaches the cart, it sets off a cluster of crackers, and then slides back to its point of departure. After a few moments, hundreds of multicoloured fireworks positioned on the cart go off, accompanied by cracks and whistles. A Catherine wheel on top lights up and starts spinning, ending with a loud bang and opening up to form the petals of a lily. Then four small gonfalons appear, bearing the emblems of Florence, of the old Pazzi family, of the Wool Merchants� Guild and currently, as a sign of peace in the world, of the UN. When: the cart starts from via Il Prato at 9 am. At 10 am the procession of clergy starts from the Church of SS. Apostoli. Explosion of the Cart at 11 am. The feast takes place in the town of Signa on Easter Monday; this year is the 700th anniversary of the celebration. A procession is held every year to honour the Blessed Joan, who lived in Signa and whose relics, still kept in the parish church of San Giovanni, are exposed to worshipper on Easter evening. The procession is animated by the historical pageant of Signa, with flag-weavers and musicians. 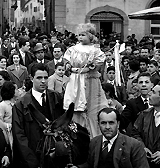 The procession is followed by the parish priest of Signa and by a donkey, on whose back rides a child dressed like an angel, with a sparrow in his or her hand. The little angel and the sparrow refer to two miracles attributed to the Blessed Joan, who is supposed to have brought back to life a child and healed a sparrow. When: at 9 am the procession starts from the historical centre of Signa. During this period it is also possible to do some shopping in the several markets and most of the shops in the central area will be open. It can be useful to get some more information about transport.